Salted caramel nut bark - A delicious homemade treat! This is pretty epic! Seriously, good. 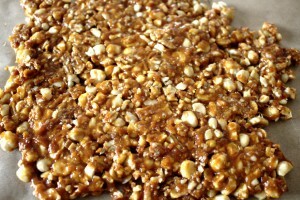 In fact, this snack should come with a warning that this Salted Caramel Nut Bark is completely addictive! I had to hide the jar of it from both myself and my husband as we were each taking some every time we walked past! I’m not going to pretend that this is healthy. 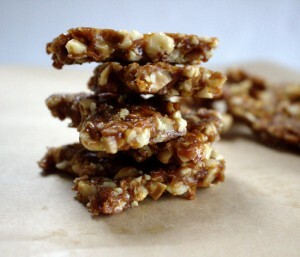 It’s healthy in the sense that it contains no gluten, grains, dairy or refined sugar. There are no strange ingredients or preservatives either. However, all that said: sugar is still sugar. This is the kind of decadent treat you should reserve for a special occasion. 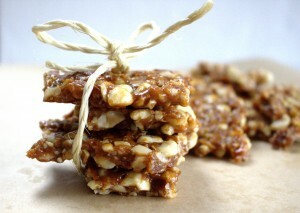 I’m all about food gifts this Christmas and this recipe is perfect for that. There is no hint of deprivation with this one. 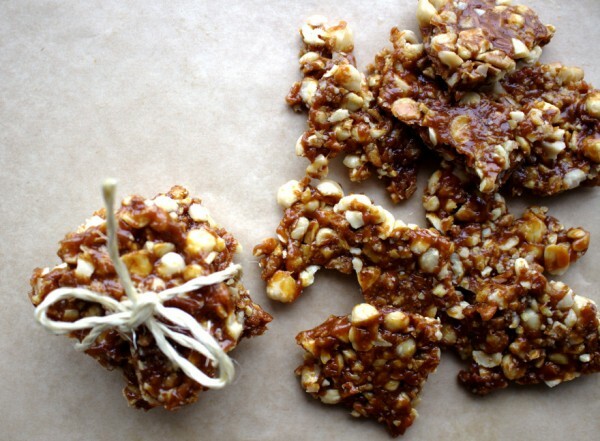 The only down side of this Salted Caramel Nut Bark is that you need some serious self-control to resist it. I was surprised at how easy it was to make my own caramel. Of course, you need to stand over it and watch carefully that it doesn’t burn. The recipe is rather foolproof once you keep an eye on it. I’ve made it dozens of times at this stage (recipe testing is VERY important!) and it’s never once gone wrong. It’s a good thing too because I call the local honey we use liquid gold. Wasting it would be devastating! I developed my caramel-making skills mostly from watching Masterchef. Basically, I learned you need to achieve a really deep brown colour on your caramel for it to taste amazing. That said, push it too far and you will have burnt caramel which would be a disaster. Trust your instincts and pull it off the stove when you’re happy with the deep brown colour. Hopefully, my comparison colour photos below will help you! 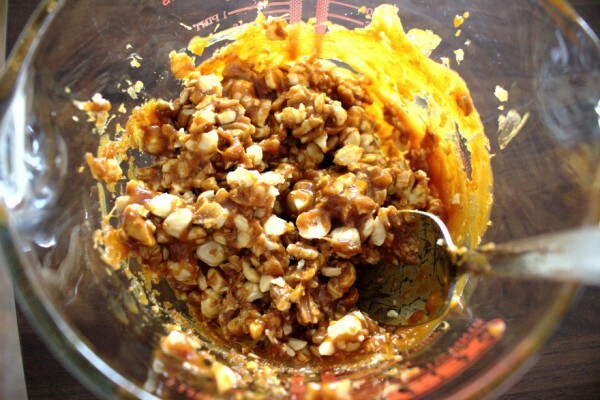 Once you make the caramel, it sets really quickly so it’s important to have your nuts chopped, heat-proof bowl and parchment paper ready. When it does set, it’s impossible to stir! Once ready, this can be kept in an airtight container for up to a week but let’s be honest: there is no way it is going to be around that long! The perfect snack when you need a (healthy) sugar rush. No gluten, grains, refined sugar or any other nasties. SCD-friendly. 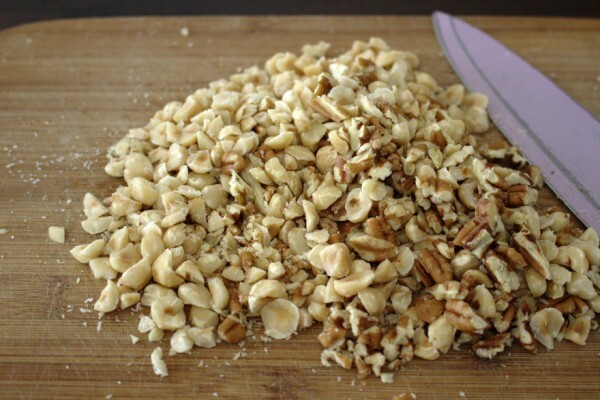 Chop all the nuts coarsely first. Place them in a glass heat-proof bowl. 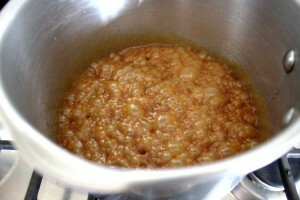 Once the caramel is ready, you will need to more very quickly as it sets very soon. 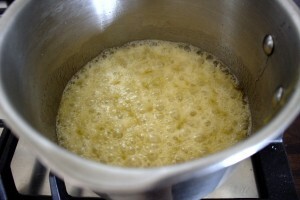 Place the butter in a saucepan on a medium heat and allow to melt. Once melted, add the honey, vanilla and salt. Bring the mixture to the boil then turn down the heat to low. Continue to cook for a further 10-12 minutes until your caramel turns a rich, brown colour. Stir continuously so it doesn't burn. Once ready, pour immediately into a heat-proof bowl and stir fast to cover all the nuts in the caramel. 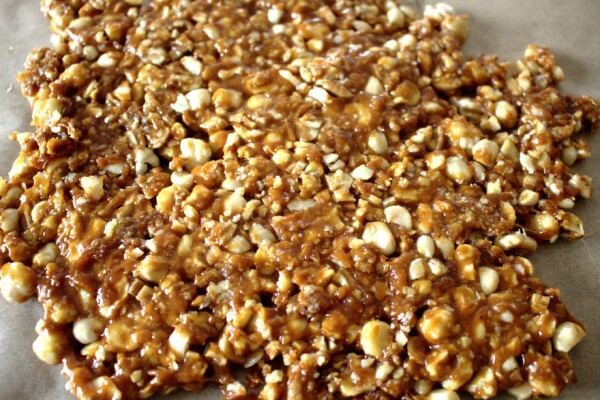 You need to move fast because once the caramel hardens, it is impossible to stir. Place the mixture on a layer of parchment paper and smooth out to flatten. Allow to set for 30 minutes to 1 hour. Then, break into pieces and enjoy! * You can substitute any other nuts if you prefer.